Plot the hierarchical clustering as a dendrogram. The dendrogram illustrates how each cluster is composed by drawing a U-shaped link between a non-singleton cluster and its children. The top of the U-link indicates a cluster merge. The two legs of the U-link indicate which clusters were merged. The length of the two legs of the U-link represents the distance between the child clusters. It is also the cophenetic distance between original observations in the two children clusters. The linkage matrix encoding the hierarchical clustering to render as a dendrogram. See the linkage function for more information on the format of Z. The p parameter for truncate_mode. No truncation is performed (default). Note: 'none' is an alias for None that’s kept for backward compatibility. The last p non-singleton clusters formed in the linkage are the only non-leaf nodes in the linkage; they correspond to rows Z[n-p-2:end] in Z. All other non-singleton clusters are contracted into leaf nodes. No more than p levels of the dendrogram tree are displayed. A “level” includes all nodes with p merges from the last merge. Note: 'mtica' is an alias for 'level' that’s kept for backward compatibility. For brevity, let \(t\) be the color_threshold. Colors all the descendent links below a cluster node \(k\) the same color if \(k\) is the first node below the cut threshold \(t\). All links connecting nodes with distances greater than or equal to the threshold are colored blue. If \(t\) is less than or equal to zero, all nodes are colored blue. If color_threshold is None or ‘default’, corresponding with MATLAB(TM) behavior, the threshold is set to 0.7*max(Z[:,2]). Includes a list R['leaves']=H in the result dictionary. For each \(i\), H[i] == j, cluster node j appears in position i in the left-to-right traversal of the leaves, where \(j < 2n-1\) and \(i < n\). Plots the root at the top, and plot descendent links going downwards. (default). Plots the root at the bottom, and plot descendent links going upwards. Plots the root at the left, and plot descendent links going right. Plots the root at the right, and plot descendent links going left. By default labels is None so the index of the original observation is used to label the leaf nodes. Otherwise, this is an \(n\) -sized list (or tuple). The labels[i] value is the text to put under the \(i\) th leaf node only if it corresponds to an original observation and not a non-singleton cluster. The child with the minimum number of original objects in its cluster is plotted first. The child with the maximum number of original objects in its cluster is plotted first. Note distance_sort and count_sort cannot both be True. The child with the minimum distance between its direct descendents is plotted first. The child with the maximum distance between its direct descendents is plotted first. When True, leaf nodes representing \(k>1\) original observation are labeled with the number of observations they contain in parentheses. When True, the final rendering is not performed. This is useful if only the data structures computed for the rendering are needed or if matplotlib is not available. When True, no labels appear next to the leaf nodes in the rendering of the dendrogram. Specifies the angle (in degrees) to rotate the leaf labels. 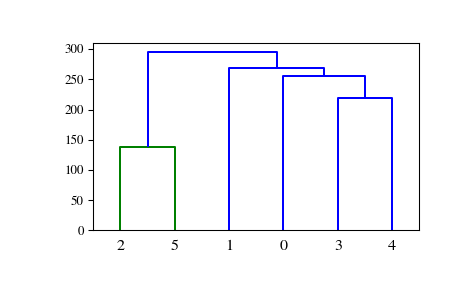 When unspecified, the rotation is based on the number of nodes in the dendrogram (default is 0). Specifies the font size (in points) of the leaf labels. When unspecified, the size based on the number of nodes in the dendrogram. When leaf_label_func is a callable function, for each leaf with cluster index \(k < 2n-1\). The function is expected to return a string with the label for the leaf. Indices \(k < n\) correspond to original observations while indices \(k \geq n\) correspond to non-singleton clusters. # First define the leaf label function. # a rotation of 90 degrees. When True the heights of non-singleton nodes contracted into a leaf node are plotted as crosses along the link connecting that leaf node. This really is only useful when truncation is used (see truncate_mode parameter). colors the direct links below each untruncated non-singleton node k using colors[k]. If None and no_plot is not True, the dendrogram will be plotted on the current axes. Otherwise if no_plot is not True the dendrogram will be plotted on the given Axes instance. This can be useful if the dendrogram is part of a more complex figure. This matplotlib color string sets the color of the links above the color_threshold. The default is ‘b’. A list of color names. The k’th element represents the color of the k’th link. Each of them is a list of lists. Let icoord = [I1, I2, ..., Ip] where Ik = [xk1, xk2, xk3, xk4] and dcoord = [D1, D2, ..., Dp] where Dk = [yk1, yk2, yk3, yk4], then the k’th link painted is (xk1, yk1) - (xk2, yk2) - (xk3, yk3) - (xk4, yk4). A list of labels corresponding to the leaf nodes. For each i, H[i] == j, cluster node j appears in position i in the left-to-right traversal of the leaves, where \(j < 2n-1\) and \(i < n\). If j is less than n, the i-th leaf node corresponds to an original observation. Otherwise, it corresponds to a non-singleton cluster. It is expected that the distances in Z[:,2] be monotonic, otherwise crossings appear in the dendrogram.